Came across this article in my news feed and thought it was interesting and worth sharing. 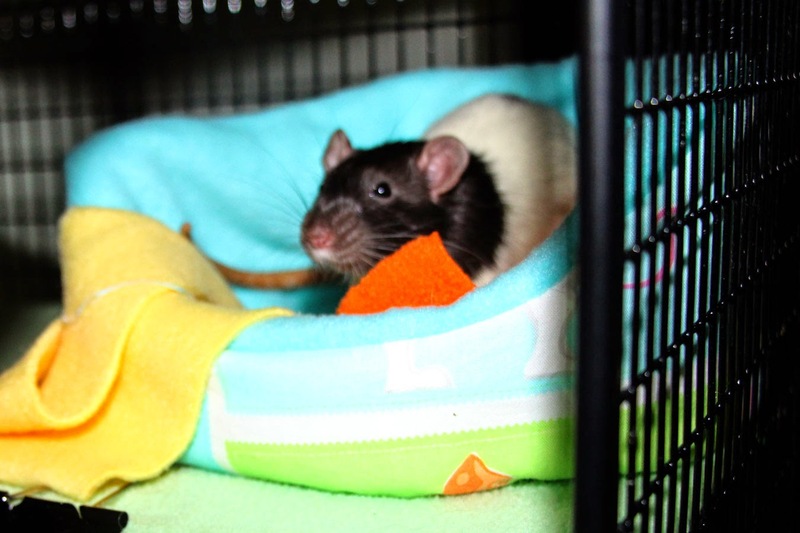 Yesterday, Jeremy, Hammie, and BoBo got brand new hammocks in their quarantine cage. I like to make a new set every time we get new rats - something that I will always associate as being uniquely theirs. Plus, the boys were staying in some flowery hammocks, as all my unused sets were either flowers/butterflies for the girls or holiday themed. 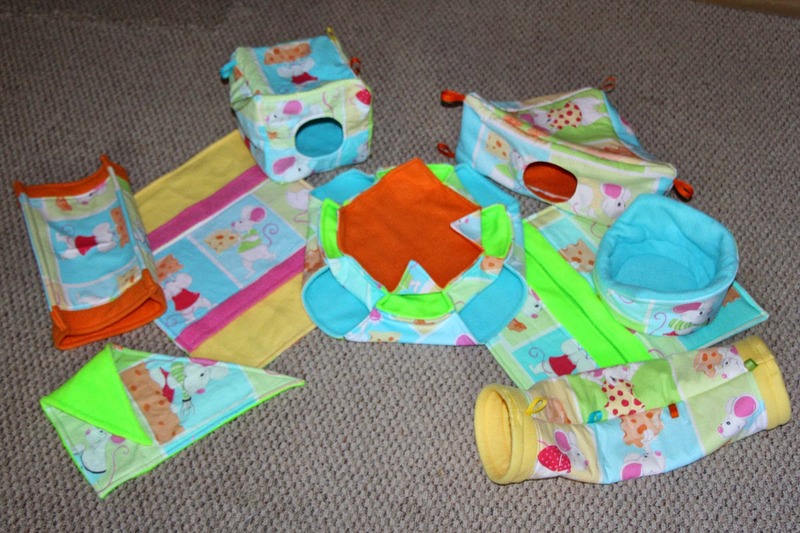 They needed something gender neutral and I had just the fabric. I actually bought this fabric a while back from fabric.com and it was intended for hammocks for Casper. But when the vet diagnosed his lung tumor, I didn't want to spend my spare time sewing hammocks - I wanted to spend more one-on-one time with Casper, so I never used it. It features white mice (but they make good rats as well), both males and females, and their obsession with stealing and eating blocks of cheese. It was from the Lewe and Norton line of fabric, and unfortunately, this particular cotton print is no longer available on their site. The coordinating fabrics have been discounted, so I am guessing they will no longer be carrying it. In the process of making the hammocks, I think I finally perfected the Rigilene cuddle cup - at least as perfect as I will ever get. I added a second layer of batting so that there is batting on both sides of the Rigilene frame. This also makes the cup more cushy. The Rigilene holds the shape of the cup so they cannot trample over it and flatten it. 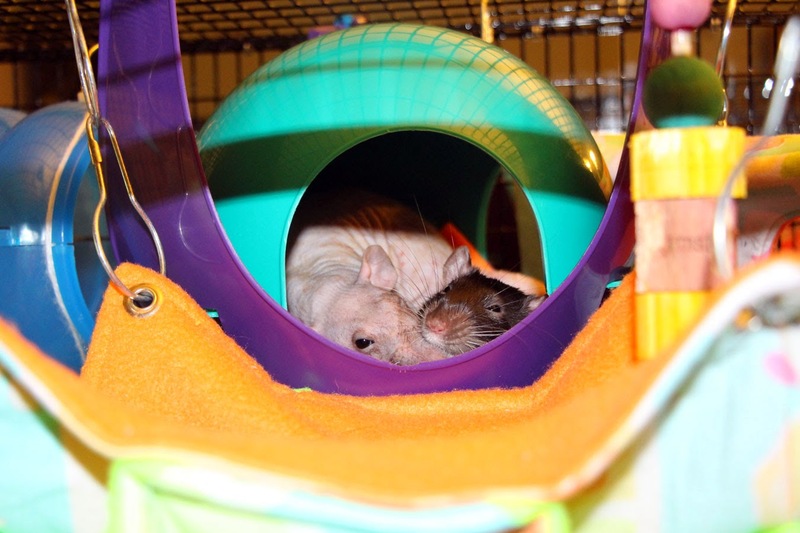 My rats are much more likely to use this type of cuddle cup than the standard cup without the Rigilene frame. The next time I make one, I will photograph the steps and add it to the tutorial. Hammie can't wait to see us when we come to the cage. After spending a week with the new boys, their personalities are starting to come out. Hammie (the one with the beige markings), is definitely the dominant one of the bunch. The boys have had a few squabbles - usually during out time and not while in the cage - and Hammie is always involved. He is not always the instigator, but in the end, he ends up the victor. You can tell they are a little leery of him. But no one has been bitten: no blood, no foul. There have been a few mighty loud squeaks and hard tumbles, but everyone lives together peaceably and shares food, cage, and cuddles just fine. So far, it seems like normal young rat dominance play, but it is something to keep an eye on. Some of the males from this rescue are in line for neuters for hormonal aggression, so it is something to watch out for as these rats mature. and scrapes are clearing up on antibiotics. Bobo is the sweetie of the group. He loves his people and is a natural born shoulder rat. He loves to be handled and wants to climb out of the cage and into your lap every time you open the cage. He does not like it when another rat climbs on top of him. I am sure he had quite enough of this when he was in an overcrowded cage, and he came to us with the resulting scratches. This experience has made him a little sensitive to being walked on, and he is sure to stand up and challenge anyone who tries. The good news is that we had his abscess drained on Tuesday and he is on trimethoprim sulfa for three weeks to help the abscess to heal without reforming and also to help his scratches heal. His skin is already incredibly improved, with many of the scratches having healed up quickly after starting antibiotics. There is still a slight swell where the abscess was and the vet will be checking in on him next week. We will see what she thinks. However, it is much reduced from what it used to be. If he had fur, I wouldn't even know it was there. think they had one of these in his last home. 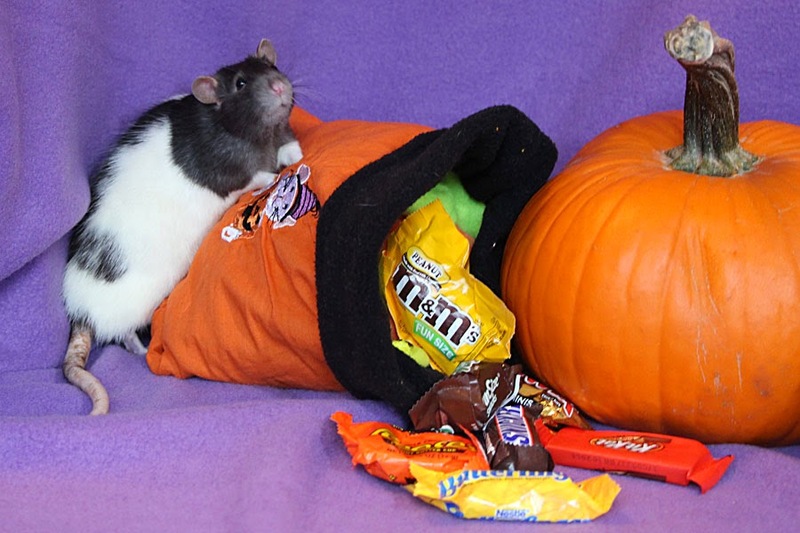 Jeremy is the youngest little guy and he is exactly what you would expect from a young rat. He shows no signs of aggression and is comfortable with both Hammie and Bobo. I have caught him curled up near each of them at different times. He is inquisitive and curious and extremely friendly and he is quickly losing his fear of being picked up. Sometimes, you can tell he wants to be picked up, but then he has second thoughts at the last minute. If you are sitting on the floor, he has no qualms about climbing onto your lap and up to your shoulder. 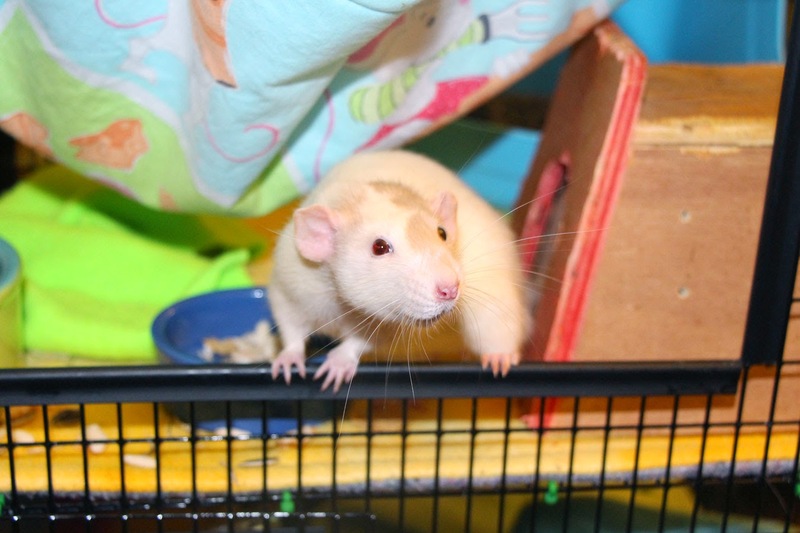 All three boys are just wonderful and we can't wait to move them into the rat room and start introductions. I am certain that intros with Ruby will go well - she is so laid back and sweet and has never had problems being introduced to boys in the past. I can also tell that Ruby is missing her sisters. It must have been hard for her to lose them both in such a short time frame. She was a little quiet and withdrawn when we returned from vacation, but that might also have been from us having been gone for a week. She is starting to come back out of her shell again. Burt had no problems with intros to the girls (a few scuffles with Jo, but overall, things went smoothly) and has lived with another male in his first home, but I am unsure how he will be with intros to new boys. I am hoping that things will go smoothly since they are so young, but it is possible that Hammie and Burt may have some dominance issues to settle. Burt won't let Hammie boss him around the way Bobo and Jeremy do. And Burt has been known to like a good wrestle - so I worry a little about Bobo getting scratched up during intros. But we will take things slowly when the time comes and see how it goes. I recently took part in a discussion on an avicultural forum that relates to the way we acquire animals. There are a number of terms being used in this discussion and they are terms that are often used incorrectly. These terms are rehome, adopt, rescue, and purchase. The following are my interpretations of what these terms mean, when they are appropriate, and why they should be used in this way. You rehome an animal when you are no longer able to or no longer want to care for it, but you don't want to surrender it to a shelter. You instead want to find the new home yourself. Your goal is solely to find a new home for the animal to live out its life. Money is not the focus of the exchange. Idealistically, no money changes hands as the sole purpose is to find a good home for the animal. 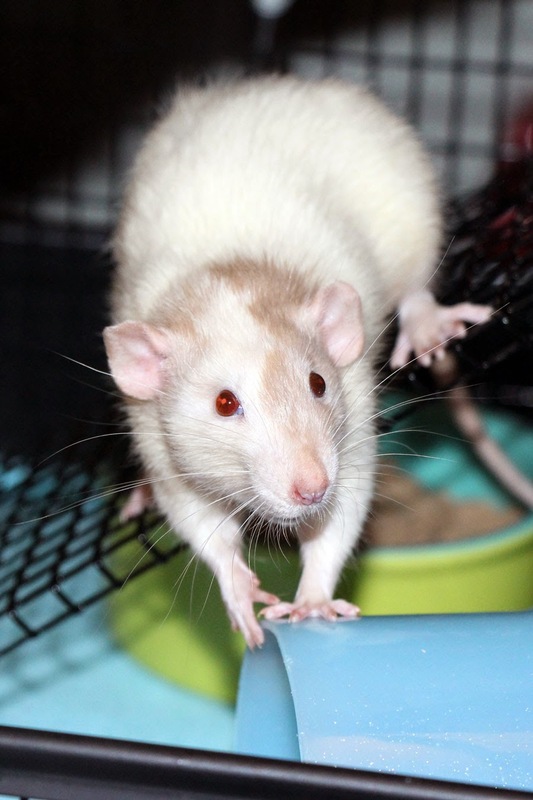 Realistically, a "rehoming" fee is often charged - not to recoup expenses or to make a profit from the exchange, but just to make sure the new owners are serious about caring for the pet and, in the case of rats, are not intending to use them as free snake food. This fee is advertised, but is often not collected if the prospective owner can establish that they are a qualified pet owner and can assure the original owner of the intentions of caring for the animal properly. Rehome is starting to be used improperly, likely due to the requirements of websites such as Craigslist. Craigslist does not allow for the sale of animals outright. Craigslist does allow advertisements for rehoming of animals and they allow for a rehoming fee. Because of this, breeders are starting to advertise their animals as having a "rehoming fee" instead of a price. Technically, they are selling their animals against the rules of Craigslist and taking liberties with terminology to slide under the radar. It is important that this terminology shift not gain ground. Breeders of animals should claim to sell their animals for a price, and not claim to rehome them for a rehoming fee. When you breed an animal with the intent to sell, you are not rehoming a pet you can no longer care for. You are selling offspring you bred for that specific purpose. You adopt animals from a rescue or shelter. You do not adopt from an owner rehoming an animal or from a breeder selling animals. Adoptions occur when a third party organization steps in between an original owner and the new owners, taking the animal in, providing medical care, and going to great lengths to find the right home for the new animal. Adoptions usually include an adoption fee. This fee helps keep the shelter in business, paying for some of the costs and vet bills associated with the animal. It also ensures that the owners are committed to caring for the new pet and will look at it as something with value, and not something that is disposable. The adoption fee is often mislabeled as a rehoming fee. When you adopt an animal, you are usually not free to then sell that animal or rehome it. The animal must be turned back over to the adopting agency. This rule exists for many reasons. First, adoption agencies want to make sure that any animal in their care ends up in a good home for life. Second, sometimes rare, expensive animals find their way into rescues. Rescues charge an adoption fee that tries to cover some of their expenses, but it is not based on the rarity or value of the specific animal on the free market. Thus, sometimes, animals can be adopted cheaply from a rescue, and then turned around and sold for a profit, with no regard to the qualifications of the new owner. This is obviously not in the best interest of the animal and thus, rescues want to prevent this from happening. Therefore, it is important to use the term adoption properly, as the term implies not only taking in an animal that needed a home, but also a loss of some of your rights as a pet owner. When you adopt an animal, you lose the ownership right to sell that animal or even rehome it. Nonetheless, people often use this term incorrectly. People do not want to think of acquiring their animals as a business transaction and thus are starting to trend toward the term "adopt" rather than "purchase" or "buy." So, it is not uncommon to hear someone say that they have adopted their animal from a breeder or from a pet store. They did not. They purchased their pet. Unless, of course, the pet store adopted out the animal through an animal rescue program that did not require a fee going to the pet store itself (Petco sometimes has animal adoptions available - our Casper was adopted through the Illinois Doberman Rescue and Petco). Breeders have picked up on this and have followed in the footsteps of rescues, calling their sales "adoptions." They have made up "adoption" applications for people interested in purchasing their animals. While the application process is a good idea, this is not an adoption. This is the sale of an animal and and such documents would be more correctly called a "sales contract" or "purchase application." Most of the time, the pet owner himself did not rescue the animal. Usually, a rescue or shelter rescued the animal and the pet owner adopted him. Sometimes, individuals do rescue an animal, when they find the animal in a bad situation and convince the owner to surrender the animal to them without a fee. Note that if a fee is involved, it is usually not a true rescue. If money exchanges hands, it amounts to a purchase, with the original owner making a profit and going on to commit the same sins again to make another profit down the road. You are replacing one animal in a bad situation with another animal coming into that exact same situation. Thus, if you see an animal in deplorable conditions at a pet store and you purchase that animal, it is not technically a rescue. It is a purchase, with the pet store making a profit on that animal and replacing it with another that will exist in the same deplorable conditions. A rescue that just swaps one unfortunate animal with another gets nowhere. On the other hand, if you see an animal at a pet store needing medical care and you offer to take the animal off their hands and get it treatment, and the pet store surrenders the animal without payment, that could be considered a rescue - as the animal receives care it would not have gotten and the store loses its investment in that animal. Another will come to take its place, but likely not with the same problems. This is the most significant of the terms and no one wants to use it correctly, but everyone should. When you buy an animal from a pet store or a breeder, you are not adopting, you are not rehoming, and you are not rescuing, you are purchasing. Purchasing something gives you rights of ownership. These rights are important to us as pet owners. If we are to ensure that we always have control over the decision making regarding our animals, assuming we are keeping them lawfully in good conditions, then we want to be owners of our pets. Not guardians or keepers or any other such animal-friendly terms, but owners. We don't want anyone to be able to come into our homes and take our animals away because they have other ideas about how they should live. We want to own our pets. The more our language moves away from terms that imply ownership and towards terms that make us feel good but that actually imply a loss of some of the rights of ownership, the easier it can be for animal rights groups to pick away at those rights over time. There is nothing wrong about owning an animal. Owning an animal doesn't mean we love them less or treat them like objects. It only means that we get to decide how that animal should live and be cared for, as long as we are keeping them in lawful conditions and not subjecting them to neglect or abuse. All of these terms have important roles in animal acquisition, but it is important that we use these terms correctly. More and more, the lines have begun to blur, and the more that happens, the more we lose important distinctions between the terms and situations. 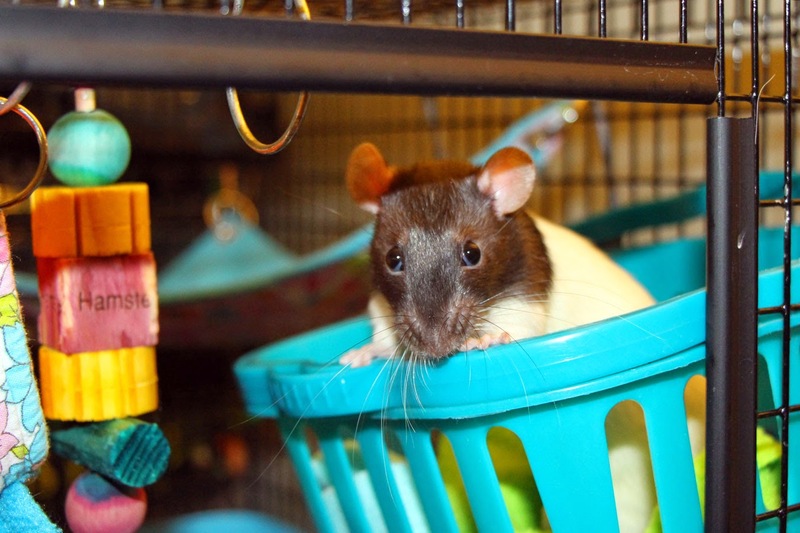 There have been a few hoarding situations recently that have resulted in rescues being overwhelmed with ratties needing new homes. 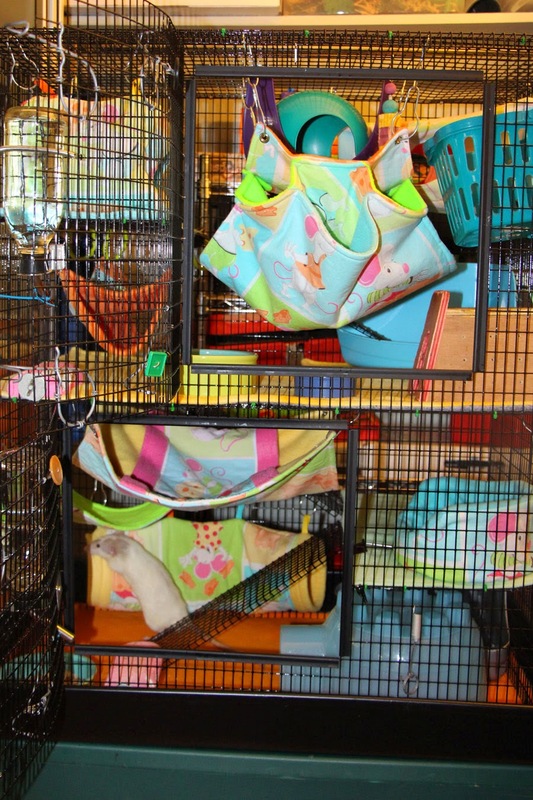 One of those cases was in Millersville, MD, where over 100 rats were crammed into two small Guinea pig cages. Dakota's Dream rescue in Virginia and Small Angels rescue in Maryland have stepped in to help find homes for these animals. The boys have gone to Dakota's Dream and the girls, to Small Angels. Both rescues will be looking for good homes for these animals and can also use help with vet and care costs. The girls all are being spayed and some of the boys will be needing neuters. 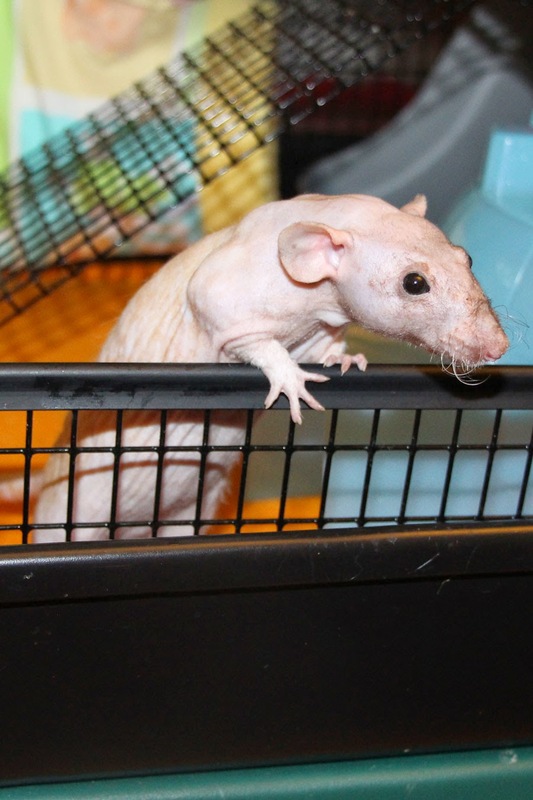 Because of the poor conditions at their original home, many of the rats have been scratched and some of the wounds have advanced to become abscesses. For more information about how to adopt or help these animals, you can review this thread on Goosemoose: http://www.goosemoose.com/rfc/index.php?topic=4105623.0 or check out their Facebook page: https://www.facebook.com/Millersvillerats. This is not the only hoarding case that has surfaced, however. Another case has been making news in Dayton, Ohio. 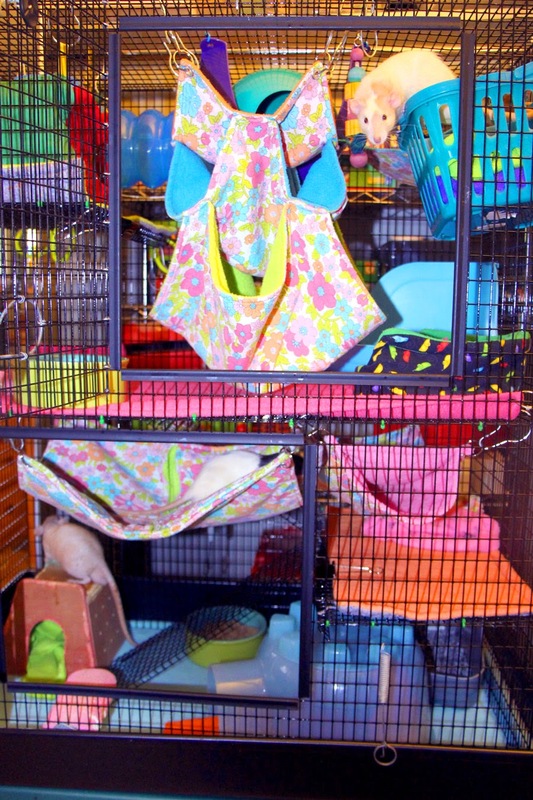 Rattie Tattie rescue has taken in 116 rats from one apartment where they had been living in deplorable conditions. They are also working on setting up rat trains to transport the rats to surrounding states. More information about that situation can be found on this thread on Goosemoose: http://www.goosemoose.com/rfc/index.php?topic=4105695.0. 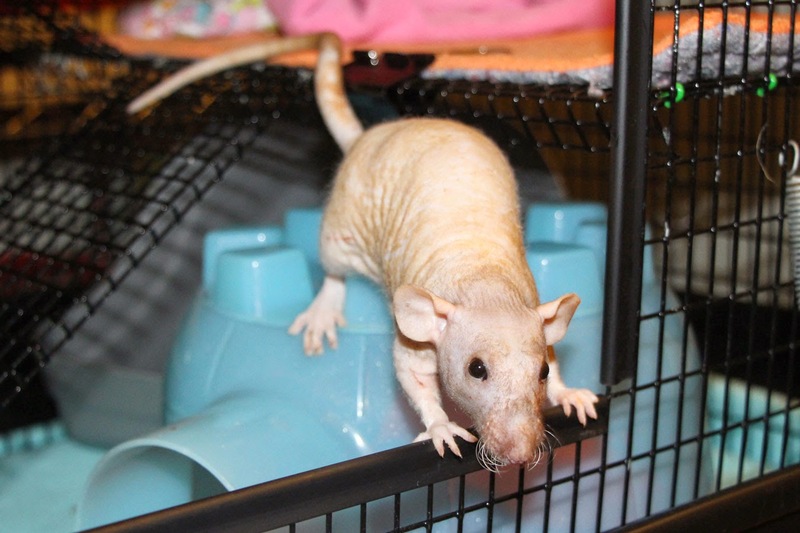 Bobo is a hairless dumbo rat, about 3-4 months old. He was named by my youngest son. I am unsure of the genetic cause of the hairlessness - whether he has the hairless gene or the double rex gene (two rex genes). He has some very short whiskers, so I would normally guess double rex. However, I have not seen any pictures of rex rats coming out of this situation, which I would expect if he was double rex given the number of hairless rats that were coming in. I have no experience with either one and so cannot make the distinction. Bobo is very sweet. He already crawls right into my arms when I open the cage door. He has some scratches from his past bad experiences and an abscess on his neck below his chin that we will be addressing with the vet. My oldest son requested and named Jeremy. He is the youngest of the group, only 8-9 weeks old. He shies away from the hand at first approach, but comes right back to it if you leave it there. Like Bobo, he is gentle and sweet. He found the space pod in the cage right away and loves to curl up inside. Hammie, like Bobo, is 3-4 months old and a dumbo. He has beige markings, and at least one ruby eye. I am unsure at this time if the other eye is ruby or black. He is very active and inquisitive and comes right to me to see what I am up to (am I bringing him a treat?). He tries to get away from me when I attempt to pick him up, but he really does not seem afraid of me at all - just a little nervous about being picked up. I was supposed to name him, but while I was working on figuring out the right name to suit him, my kids named him behind my back. All three rats are in quarantine and living it up in the Martin's R695. I can tell they never had a cage like this - they went nuts when I first moved them in. It must be a huge upgrade from sharing a Guinea pig cage with 50 other rats. It has been a sad week for us. On Saturday, Jo started showing symptoms similar to Bela's - heavy breathing, lethargy, and lack of appetite. On Sunday, we brought her to the vet who did x-rays. Her lungs were clear and perfect but everything below that was a cloudy mess on the x-ray. There were masses in her abdomen, likely originating in the liver but spreading to the stomach, and there was fluid in the abdomen. The vet prescribed furosemide (Lasix) for the fluid, but Jo passed away suddenly at home before the presciption could be filled and started. I was surprised and grief stricken to lose her so suddenly, but am grateful that she didn't suffer a long illness and went quickly. In the mean time, Bela had progressively gotten worse. She was not eating anything and had bouts of gasping for breath, just like Pirate did before he passed away. She was interested in nothing except taking that next breath. It broke my heart to do it, but we eventually decided we needed to have her put to sleep. Because it was a lung tumor, there was no hope of her improving and she just had no quality of life. We wanted her to go peacefully. We loved these girls immensely and it is very difficult to lose them both in one week. The rat room feels so quiet and empty now without them. Burt and Ruby seem lonely in their big Critter Nation cage. 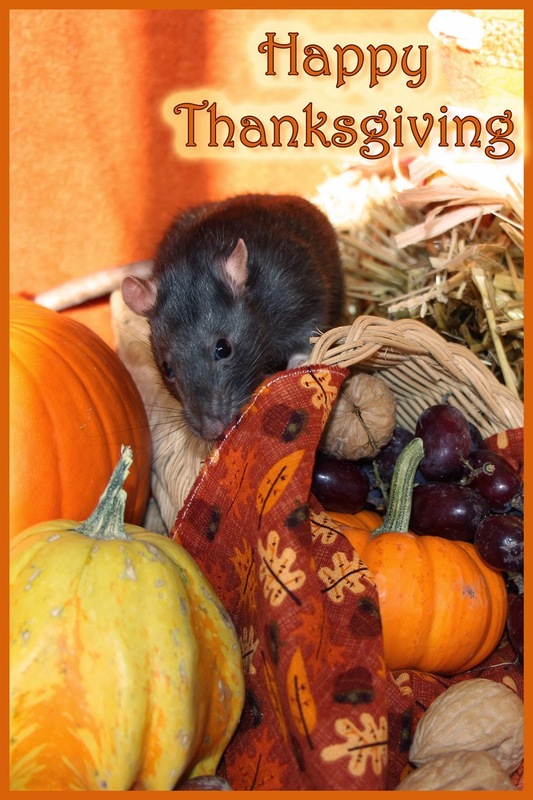 Needless to say, we hope to be bringing home some new rat kiddies in the near future. Plans are already in the works.